Did you read the votes? I think the SoV judges - past and present - do a pretty good job of articulating why they voted as they did. You are oversimplifying why some judges voted why they did and completely overlooking others. Agent Malcolm by Tmac2200 has received 3 NO votes to review (Killometer, Scytale, ZBeeblebrox) and is removed from the process. The two thumbs down votes barely mention the figure and are more concerned with the mechanics. Take a look. When we vote no to induct a figure, we do lay ouit all our concerns. There are few things that concern me about these guys but I want to give them a try. I vote YES to review Threforian Raptor. Threforian Raptor by Fi Skirata has received 5 YES votes to review (Killometer, qt.bangerang, Scytale, Super Bogue, ZBeeblebrox) and moves on in the process. I vote YES to review Tentacles of the Kraken. I've been vacillating over it since I saw it, but it's a very interesting concept and I think that it needs some table time to really judge it. Tentacles of the Kraken by qt.bangerang has received 4 YES votes to review (Killometer, Scytale, Super Bogue, ZBeeblebrox) and moves on in the process. I would like to submit my Ragweb Spider custom for SoV review. Balance- I've done extensive playtesting with this figure. It was originally priced at 50 points, but after going through the 3FG process and doing more games with the figure, we lowered the price based on survivability and how it impacts the game. Combine that with the fact that it is a bonding hero, and I ended up pricing it at 35 points. Playability- Though Poisonous Bite is a bit wordy, it is easy to understand after the first time you read it. Just a simple marker/D20 mechanic that can make you think twice about what heroes you send against the spiders. Climb X3 is a no-brainer, considering the miniature's size. Master stats are balanced, as it packs more punch than the average spider, but is slower. Left-box stats are just fine, as it bonds with Fyorlags and since it is beefier than them, I changed the personality to Ferocious, rather than the Wild of Fyorlags. Marked as it is with the odd shape of a spider and the red/black/grey color scheme, it is easy to pick out in a crowd of other figures. I put them on a normal-size HeroScape single-hex base. Creativity- It adds a new mechanic to the game, and bonds with an existing squad. It adds a new type of bonding option for that squad in that the previously released Predators required some serious investment in points, and were Unique/Uncommon, whereas this unit is cheap and Common. 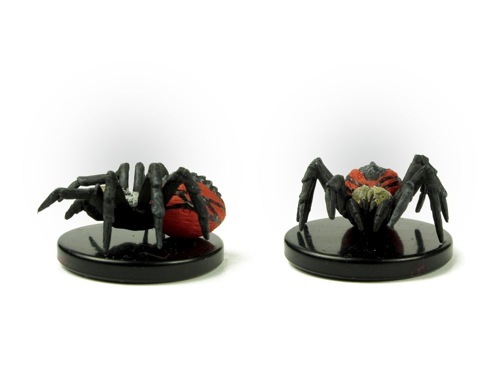 Theme- As a spider with an actual poison power, and fitting into an already-existing faction of HeroScape, it certainly fits into the HeroScape universe. Accessibility- I checked availability just last night. Auggies alone has 50 figures, and other sites combined total about 40. Ebay matches those numbers, depending on the time you check. So all told, it comes out to about 120-130 figures, and ranging from $2.00 to $4.00, from what I've seen. No modification other than rebasing the figure is required. Other- For the purposes of Poisonous Bite, use Marvel Wound Markers. Last edited by Son of Arathorn; May 17th, 2012 at 08:34 PM. Reason: Updated Card. I'm not seeing a card. Great nomination write-up, lousy card. I do like the bonding option for the Fyorlag Spiders and another spider for Estivara to play with. Also, while I am still thinking about them...why Aquilla over a Lolth spider for Utgar?